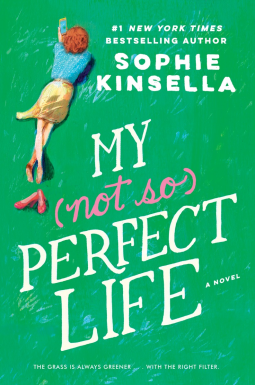 My Not So Perfect Life is the type of witty chick lit one would expect from bestselling author Sophie Kinsella. The deliverance is wholly human and sure to tickle readers all over! I will admit that this is my first Sophie Kinsella novel, ever, and I almost didn't keep reading it. It took a minute to get in sync with Katie's voice and understand what kind of person Katie is and boy was she annoying! However, as I continued reading I realized that Katie is as human as we all are and prone to pretending that life is perfect through the rose colored filters of social media. Katie is struggling to make it in London. Her commute is abominable and her living arrangement is less than stellar. According to her dream, though, it's all worthwhile. Her boss Demeter has a seemingly picture perfect life, from the top job to the family, and Katie wants to be like her. Her hero worship is part of what makes her so annoying at the beginning of the story, because of course no one is that great in real life! When Demeter insensitively fires her it's the last straw and Katie finally gets a clue. That's where the story took a turn for the better. I could really see that the story is written in a way that allows the reader to see Katie's flaws and see her attempt to learn from her naivety. She spends time at her childhood home, helping to turn it into a glamping destination, while trying desperately to find a new job. At this point in the novel I actually felt more eager to finish it. Demeter arrives at Anster Farms with her family and throws Katie off balance. The story becomes more comedic and moves a bit faster at this point. Sophie Kinsella knows how to tell a story that manages to engage laughter and tears. This is the book to read whenever you need a good laugh and a hard hitting reality check!